The living room has needed a rug since…well, since I moved into the house. The living room/dining room/kitchen area is all tile flooring with high ceilings, so sometimes there’s a bit of an echo. Adding furniture helped, but I knew a rug would help even more. Plus adding a rug can really help pull a space together. 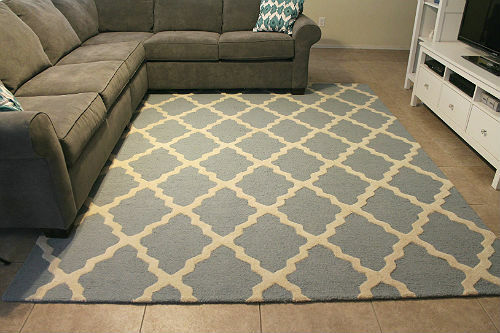 I held off buying a rug until I bought a new couch (and until our puppies were housebroken), but that didn’t stop me from eyeing the Moroccan Trellis rug from Rugs USA. Now that I finally bought a new sectional (and our dogs are housebroken/have a doggie door), it was time to do some rug shopping. 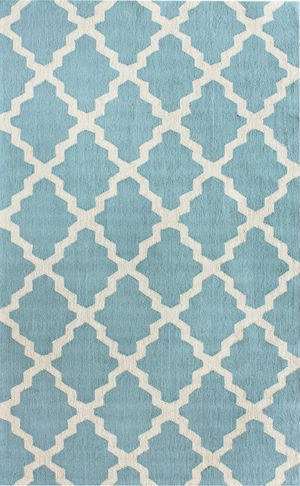 I knew I wanted the Moroccan Trellis rug in spa blue, but I wanted to wait for a sale. I refuse to spend $566 on a rug! Granted they’ve been running a 50%-off sale for awhile now, but I knew I could do better if I just waited for a holiday. Luckily I was right and over Memorial Day weekend Rugs USA had a 65%-off sale plus free shipping on all their rugs. That’s right – I got this $566 rug for $198! I think that’s a pretty good price for an 8’x10’ wool rug. 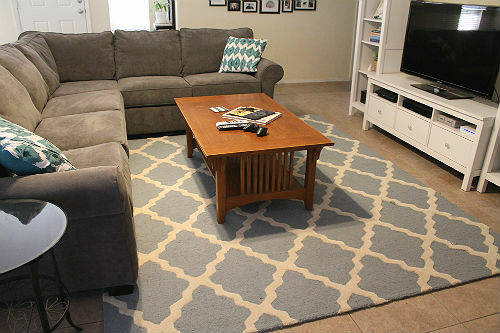 I’m so happy with my new rug and would recommend it/Rugs USA to anyone looking for a new rug (I’m not being paid/perked to say that). It’s soft, plush and gorgeous in person. I should also mention that some of the reviewers complained that the rug sheds a lot, but I haven’t noticed any shedding yet. And for anyone wondering about the colors - the white is an off-white and the blue is a blue/gray, but definitely more blue than gray. Oh, and the dogs love it too. Ringo was so excited when I rolled it out and he’s already rubbed his body over the entire thing. Now I just need a new coffee table that doesn’t block so much of my pretty new rug! Your living room is looking so grown up... sniffle... I'm so proud of it... it looks so good! And $198 is pretty magical for a rug I won't lie. High five! Oh I am so in love with that rug! It looks awesome! I just love your style! i say paint the coffee table white to match your entertainment center and the rug. i think it would give it the 'appearance' of blocking less rug. pretty pretty rug and woohoo on the savings! Love the rug and what a great deal!! I have something similar from Overstock, but I moved it to the basement family area since I still love it and it doesn't currently go well with my upstairs living room. LOVE THE RUG!! Looks great in your living room. I'm looking for a couple of new rugs so I'll have to check out Rugs USA. We have hardwoods/tile everywhere in our house except the basement, so I'd like a rug in our bedroom and the living room at least. Wow this Moroccan trellis Rug is quite beautiful. how much cost it is?